The change of plans for the New England Convention which gives the association the Crystal Palace on Steeplechase Island for an art building makes it possible to extend to the photographers of the United States an invitation to put their work on view side by side with the work of hundreds of other photographers all over the country. In former years there has always been the fear that too many pictures would be sent by individual photographers or that the space at the disposal of the Association was too small and in consequence restrictions were made which frequently prevented members from displaying a full and comprehensive collection of photographs. This year the convention extends to all of its members and to photographers generally an invitation to present a display which will fully represent their best endeavors. Every picture sent to the convention will be hung if the man who sends it says that the collection represents the best photographic work he can do. All other restrictions have been withdrawn and it remains for the photographers of New England and the adjacent territory to cooperate with the officers in making a display of photographs which has never been equalled on the continent. Ample arrangements have been made to display the collection of "one man "exhibits, which have been promised President Garo, by the leaders of photography in every state, so that the members and exhibitors need have no hesitancy in making their exhibit completely representative of the things which they are doing. President Garo believes that the greatest educational feature of a photographic convention lies in the exhibition of photographs and for this reason alone the bars have been opened to everyone alike to show his best. A great tent is to be erected on the Exposition grounds which will be given over entirely to demonstrations by the various manufacturers represented. Ample opportunity is to be given every manufacturer of photographic material to demonstrate new and improved processes for the making of photographs. 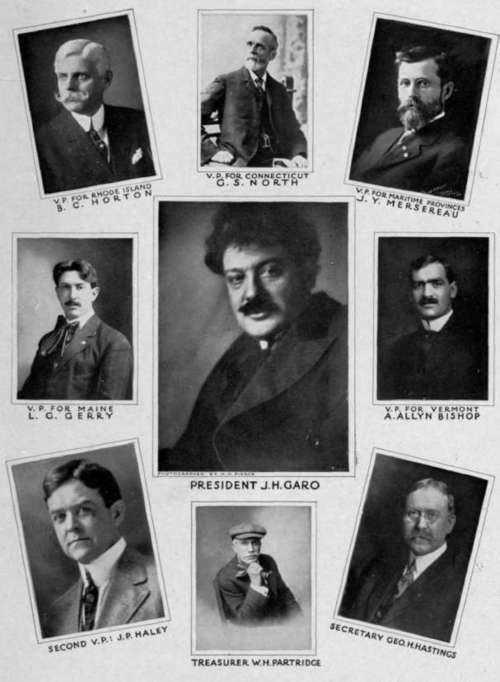 Officers Photographers' Association Of New England, 1911. 1 - The exhibitor shall become a member of the Association. 2 - The device or process shall not be actually upon the market as a manufactured product. The object of this separate and distinct exhibition is primarily to bring the photographic inventors directly in touch with manufacturers. Bridgeport is a great manufacturing center and offers splendid opportunities for the promotion of new business enterprises. Mr. H.J. Seeley, President of the Photographers Club of Bridgeport, Bridgeport, Conn., is in charge of arrangements for the Inventors Exposition. $2500.00 IN Cash offered for pictures in the Kodak Advertising Contest which closes September 20.